Cost/Availability: $1.99 on iTunes. Whole DVD available on Amazon for ~$9.00. This episode is all about helping others, whether that help is being offered or accepted. Tyrone, Pablo, and Austin are all “Tarzans,” denizens of a mysterious jungle who each have unique abilities: talking to animals, super-strength, and silence (coupled with listening skills), respectively. A visitor to their jungle home is Professor Uniqua, a scientist dedicated to returning Sherman the Worman to his native home. They all have different ideas for journeying through the thick undergrowth, but they must accept each other’s help in order to succeed. One of the best things about Backyardigans is having its characters have good hearts. Even in episodes with villains or other unsavory characters, the heroes always do the right thing, with or without a reward. Uniqua and the boys instantly volunteer to return Sherman the Worman to his home, sans any motivation to do so other than a desire to help out a friend. This is a trope prevalent throughout virtually the entire series, and is especially prominent in this episode. Not unsurprisingly, it is Uniqua who has the most difficulty in relinquishing control. She is definitely the de facto leader of the troupe, and is quite capable of carrying an episode nearly alone (especially apparent in “Fly Girl”). Thus, it is understandable that this trait pops up in “The Heart of the Jungle,” where she must rely on the Tarzans. It’s not that Uniqua looks down on them for not having her same professional status, it’s that she simply thinks her way is the best way. She does manage to shoo away the “can’t-see-’em” bugs, and has the foresight to bring an umbrella (well, it is the rainforest), and the Tarzans willingly accept her assistance. The boys contribute their own skills to the mission, of course. Tyrone converses with Sherman in order to establish the correct path, and Pablo uses his super-strength to clear obstacles. Uniqua accepts this, though insists that “it’s not very scientific,” which is her justification for ignoring Austin’s warnings about quicksand. Predictably, she finds herself waist-deep in the stuff at the end, and the boys rescue her. Uniqua does not judge this event as mere bad luck; she realizes it was her doubts about the Tarzans’ ability to help that led to the incident. The lesson in this episode, then, is using skills for the benefit of others – and knowing when to acknowledge it. 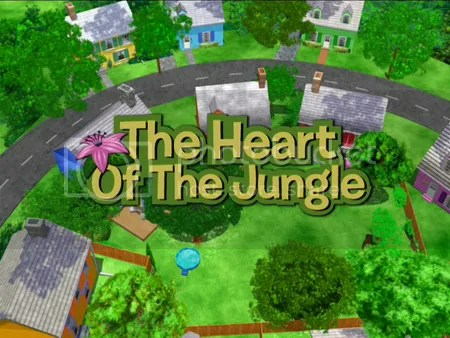 The music style for “The Heart of the Jungle” is W.S. Gilbert and Arthur Sullivan-inspired operetta, and has the distinction of the lyrics being written (and the episode, also) by the creator, Janice Burgess. “It’s Drizzling, It’s Pouring” is a song parody of “I’m a Little Buttercup” from H.M.S. Pinafore. Jungles are apparently very conducive to operettas, for we have yet another very catchy tune to sing around the house, “Into the Thick of It.” It’s also very suitable for entering schools, grocery stores, and other busy areas. Does your child have difficulty in accepting the help of others? This is the last review I wrote for Globworld before it went under. If there’s any interest for me to continue this series, I will certainly attempt to do so!